Choosing a place to live can become overwhelming and stressful pretty quick. Especially if you’re trying to find a place before your lease runs out. But it doesn’t have to be and that’s where we come in. The ownership behind Franklin West Apartments understand the struggles of apartment hunting. Here’s what makes us unique and your hunt for an apartment less painful. Franklin West Apartments has been in the real estate industry and Pittsburgh housing market since 1965. That’s 54 years of experience to be exact. In other words, we know what we’re doing. 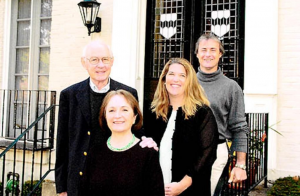 Between over beloved Shadyside and surrounding Pittsburgh neighborhoods of Butler, Oakmont, and Gibsonia, the Franklin West Family manages approximately 1000 apartments and townhouses. With our experience, you can rest assured on the strength and stability of Franklin West. One of the most attractive aspects of living in Shadyside is the gorgeous Victorian homes that line the neighborhood. We recognized the beauty early on and decided it was our obligation to maintain the character and charm of these homes. Over the years, we selected and carefully restored buildings of historical value. We paired contemporary interiors like high ceilings, fireplaces, and hardwood floors all while preserving the original characteristics of the home. One of our most treasured Victorian homes is located at 260 Shady Ave. This brilliantly structured home was built-in 1864 by the Hasting Family! Read more on all of our Victorian homes on Shady Ave! 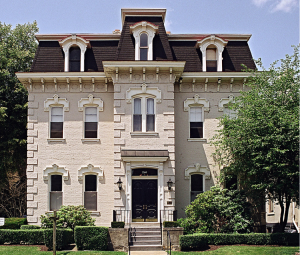 Check out Arcadia Publishing’s list of historic Pittsburgh mansions. It mentions many of our favorites like the Clayton at the Frick Pittsburgh. Yes, the houses in Shadyside are breathtaking, but there is so much more to this Pittsburgh town. Location is everything! Our Shadyside apartments are minutes from downtown and major universities like the University of Pittsburgh, Chatham, and Carnegie Mellon. What more can we say? 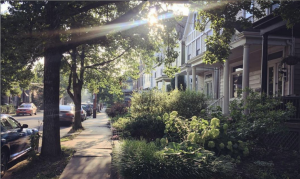 Shadyside’s tree-lined sidewalks are a runner’s haven. It’s a shopper’s paradise with the many, many locally owned businesses. Plus, finding something to do is never too hard with the community’s many events! See which businesses were selected as the best in the Shadyside neighborhood! We’ve built a reliable reputation over the years and we take pride in our business of providing the people of Pittsburgh luxury apartment services. Interested in looking at our latest listings? Click here! Don’t forget, keep an eye on our social and blogs for apartment listings, local events, and so much more!